I have a native wildflower blooming this late in the garden. I think it is the bushy American aster, Symphyotrichum dumosum, although it could be S. racemosum. It is hard to tell them apart. The flowers are arranged more loosely in the S. dumosum species and it would appear the same as the plant which has volunteered its cheerful autumn blooms in my garden. The foliage is light and airy. I often wonder how the volunteers arrive in the garden. Do they travel on the breeze or are they dropped by a passing bird who enjoyed this seed? The flowers do mature to small puffs so the obvious answer would be that they arrived on a breeze. I never saw it happen. There are no asters in the field but, nonetheless, this plant has seeded in the front of the border. No matter. It is a see through plant and one that I now enjoy. Despite intensive gardening Mother Nature often has her own ideas on what should be growing in the borders. The ragweed gets weeded out as do many of the Queen Anne's Lace seedlings since they have a tendency to take right over. This plant I leave. It is well behaved and I think you will agree, quite lovely. This is really my first Wildflower Wednesday post and thanks go to Gail at Clay and Limestone for hosting and helping to make us all aware of the natural wonders of our own specific areas. I know, purpleicious is a made up word but violaceous just does not work for the description of the color of Oakleaf hydrangea leaves at this time of year. And while the leaves do look oak like they really remind me of grape leaves but perhaps that is just because of the infusion of grape color which is so welcome as dormancy descends on the garden. The landscape has turned brown with a few exceptions. Those include the late hanging leaves, the shock of blue green kale in the vegetable garden and the green grass. 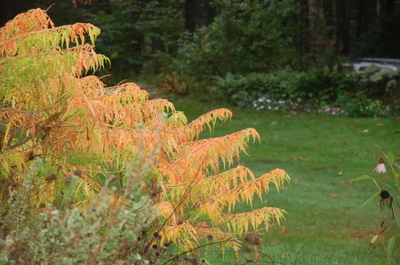 For a gardener intent on perfect combinations, late fall has to rely on evergreens and shrubs with stubborn leaves. I am enjoying the thick, aubergine colored leaves on this hydrangea. Planted in combination with the Euonymous fortunei 'Variegatus' in the foreground, this shrub only looks better. This combination is a backbone planting in the back shrub border and since it is in a bit more shade than is suitable for a flowering shrub, there are only a few blossoms on the hydrangea during the summer. 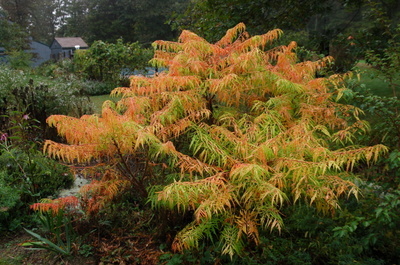 No matter, this shrub which is native to Georgia, Florida and Missouri, comes into its own in the fall and I would plant it just for the unique fall foliage. An easy plant to grow. it has yet to endure any pest problems. This oakleaf hydrangea has been in the garden a good five years and is now four feet tall and a bit wider. Plant it where it has room to spread although there are new cultivars on the market which are smaller and narrower if your garden space is at a premium. This hydrangea forms flower buds on the previous year's growth so prune only right after flowering and well before bud set in late summer. The walk through the garden is a bit more hurried these days as temperatures drop and the first snow is already behind us. I must remember to put on an extra layer and slow down a bit to make sure I don't miss these last colorful leaves of the season. What plant in your garden has gotten your attention recently? Many of us see a field as an opportunity but, not all of us see it as the same type of opportunity. I cringe when I see a field succumb to urban sprawl. Its once pristine appearance dotted with houses or worse, strip malls. I see a field as an opportunity to enjoy nature almost untamed. Almost because fields just don't happen. They require yearly mowing after the initial years of clearing. When our home was built over 3 decades ago, we cleared the land for the house but we did inherit this field. At that time there was an abundance of sheep laurel, blueberries and grasses. Constant mowing has eradicated some of the original plants but the blueberries are still here although there are fewer. There is pokeweed and milkweed along with goldenrod and grasses. I can identify the timothy grass but the fine grass which catches the morning light in dew is a mystery. Perhaps it is time to take a course in field botany but, for now, I will just enjoy the show. What is better than a 'Tiger Eye' Sumac? A grouping of three or more perhaps! 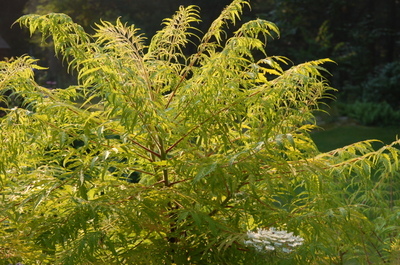 This plant was introduced to the market in 2004 by Bailey Nurseries. 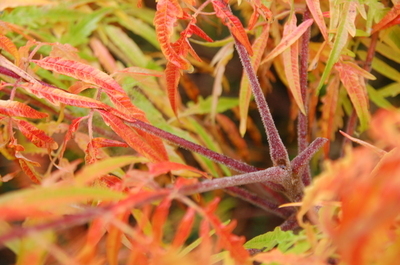 Rhus typhina is a native shrub and this particular cultivar was spotted in a group at the nursery and subsequently propagated for its' unusual acid yellow summer color. It also has spectacular fall color and great year round texture. In the winter, the skeleton is a bit coarse but architecturally interesting. The branches are covered with a fuzzy indumentum giving the appearance of deer antlers. 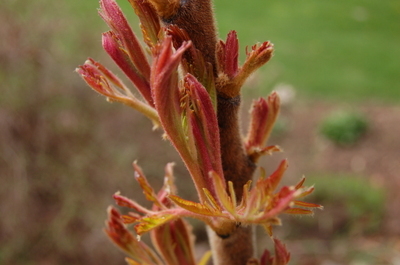 The buds emerge in the spring and are bright red with hints of pink, orange and yellow. All of the colors in the fall display are previewed in the buds. The stems of this sumac are maroon and you can see from this picture that it pairs well with Allium sphaerocephalon, drumstick allium. I could easily lose myself in this well of color. 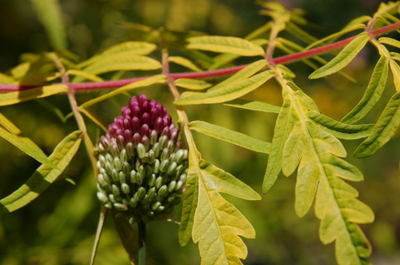 This plant is very adaptable to most soil types thriving even in clay soil. It has quite a wide range of zone hardiness growing from Zone 4 through Zone 8. I did notice some runners on this plant this spring but I just chopped them off and have not seen any more develop. Tiger Eyes has been growing in my garden for two years and is about five feet tall. Full sun is recommended. On a rainy October day it cheers up an otherwise dismal garden. Do any of you have one of these sumacs? Much has been written concerning the winged Euonymus, Euonymus alatus. This shrub has become a hallmark of fall with its' bright red foliage and its' presence along highways and in suburban areas. Once used extensively by highway crews this plant is now on many states' invasive species lists. It does seem to reseed freely under favorable conditions although my personal experience is that while I have three of these shrubs which were seedlings given to me by a friend whose plant had reseeded, I have never seen a seedling from this plant in the surrounding area. 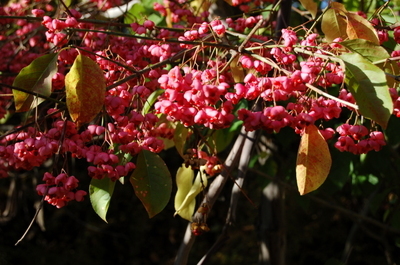 Winged Euonymus was brought to this country in the 1860's as an ornamental shrub. It is native to China, Japan and Korea. It is hard to beat its' bright red foliage of autumn. Less well know is the native Euonymus, Euonymus americanus. 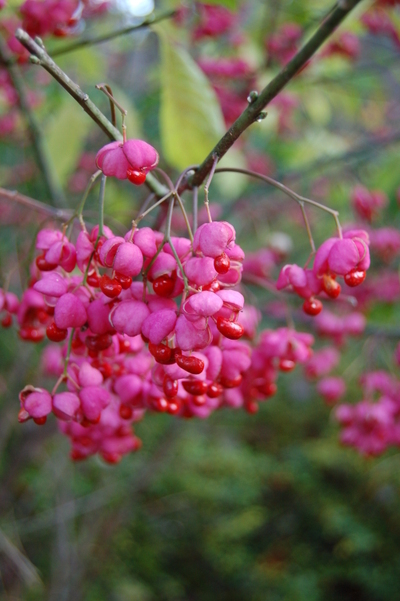 This unprepossessing shrubs' common name is American strawberry bush or ' hearts-a- burstin'. This is an understory shrub which grows four to six feet tall in well drained acid soils in shade to partial shade. It is hardy from Zones 5-9 giving it quite a range. To see one in full fruit is definitely something to talk about. The fruit is enclosed within a capsule which pulls back as it dries giving a flowering effect. This shrub is fruiting now and I can't help but marvel at its' interesting shape and the wonder of its' fruit. It is fairly nondescript most of the year but then many ornamental shrubs are until the flowering or fruiting takes place. The flower is small, white and insignificant. Would anyone look at the unblooming hydrangea and desire it for their garden? 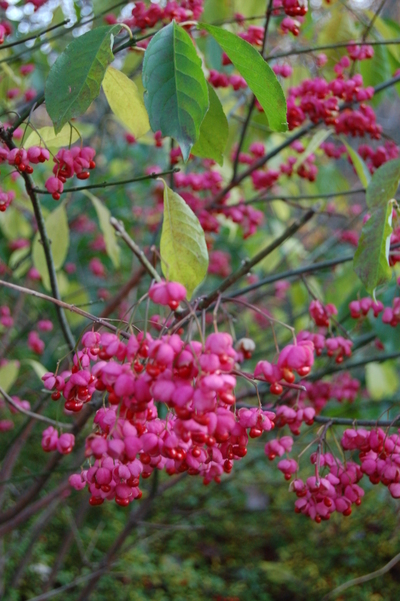 This is a great little native shrub which settles into the border or the woodland edge with dignity until it covers itself with its' flamboyant fruit. I have never seen this for sale at any nursery but perhaps I should. What do you think of this native shrub? 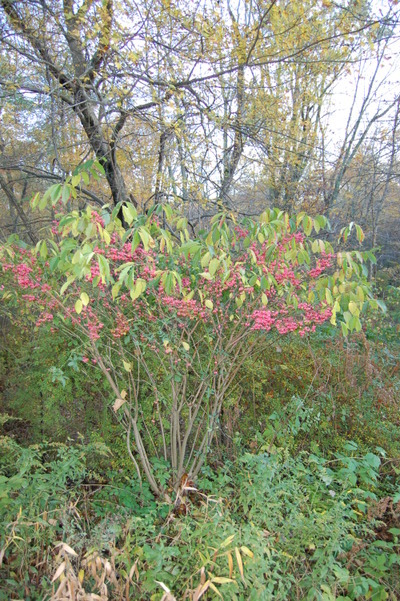 An addendum to this post...This native may be Euonymus atropurpureus rather than E. americanus. Stay tuned for further updates!